Will you join in our crusade!? The rousing finale of last year’s Les Miserables was ringing in my head as I left the cinema after watching The Riot Club, director Lone Scherfig’s adaptation of the stage play ‘Posh’. Rarely have a watched a film with fists clenched and a genuine feeling of nausea, but this gross example of bourgeois indulgence made me want to take to the streets of Westminster and go the full Tony Benn. 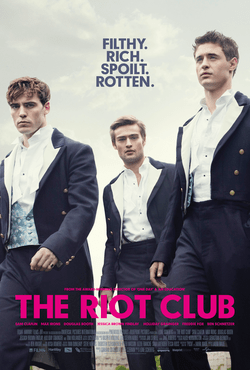 The movie tells the story of a group of upper class undergraduates at Oxford University, who are members of the Riot Club, an exclusive invitation-only society who we are led to believe are the cabinet ministers and lord chief justices of the future. We’ve all seen the photo of Cameron and Boris in their white tie and tails; well this film takes that shot and runs with it. The cast is packed with the cream of young, upper class British actors (Max Irons, Sam Clafin, Douglas Booth, Sam Reid, Freddie Fox – I got the idea that not much method acting was required from these chaps) as well as a scene stealing Tom Hollander as an ex-member who is now seemingly the Leader of the Opposition. We follow the club through its selection policy for new members (needless to say, 99.99% of us wouldn’t make the cut), initiation ceremony (exactly what you imagine it would be) and introductory dinner, which forms the centrepiece of the movie. Of course, we hate every member of The Riot Club, as we’re expected to do. But, I also hated those characters we were expected to root for and sympathise with. Max Irons’ Miles is a working-class sympathiser who we see drinking lager and wearing a jumper (look – he’s just like us! ), Holliday Granger’s Lauren is a generic northern lass who we first think will be a decent female character but sure enough she ends up in bed with Miles and turns up at his beck-and-call when summoned. Indeed, female characters are at a premium in this film – Jessica Brown-Findlay’s Rachel plays a waitress (much is made of how the poor girls are struggling to pay off their student loans) who is given absolutely nothing to do but scowl at the gents poncing around the dinner table. A complete waste of a character – Bechdel would be wincing. I have read reports of people walking out of the stage play in disgust, indeed a punter walked out of the screening I was in, and I can see why. This film isn’t badly made, badly cast nor does it have a bad plot. But when you despise every character on screen without exception, you cannot help but take against it. Perhaps I am the wrong audience (I’m a state schooler from a northern mining town after all), and I’m sure it didn’t help that I saw this film the week after seeing Pride which couldn’t be a more polar opposite film (props to Ben Schnetzer for being so convincing in both) and is more in line with my political views. I would say that this film is worth a watch – I always prefer a film to generate a strong opinion rather than one that washes over me – but once you have seen it, I’ll see you at the barricades comrade.